Coustille Sword-Dagger - TemperedWhat's this? It's not a sword, but it looks WAY too long to be a dagger. It can only be the famous Coustille dagger. These daggers were the favorites of travelers and soldiers alike. Light and compact, but strong enough to battle a swordsman with, and angled viciously to punch through mail. Often carried by the shadier elements of medieval Europe, this was, nonetheless, a wildly popular dagger. The grip is made of hardwood, with a padded and double-stitched leather wrap. 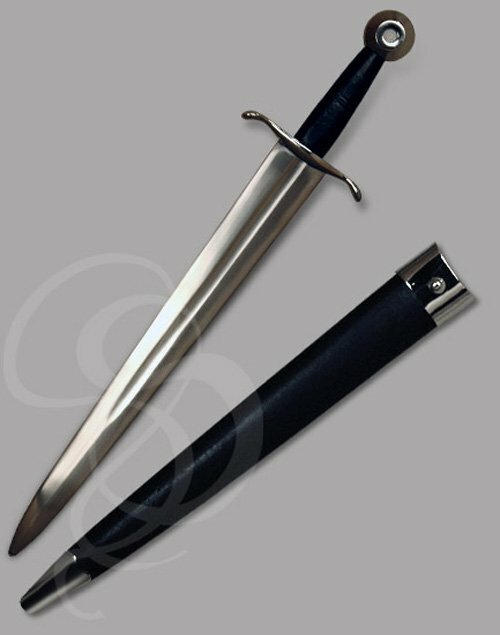 The wrap features a pair of beveled lines that circle the hilt, giving the dagger just the right amount of personality. The guard on this dagger is short and rounded, making it easy to hide and withdraw with no fear of getting entangled. A shallow cusp strengthens both the arms of the guard and the shoulder of the blade, where it meets the hilt. The dagger comes with a custom-made sheath of leather-wrapped wood. The sheath actually has a nice steel curve at the throat where it meets the rounded cusp of the dagger's cross. It also has a polished steel tip. 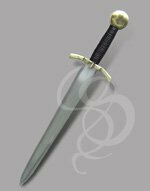 In all, a dangerous dagger that goes brilliantly with any costume (particularly dark-horse heroes), and looks intimidating hanging on a wall. If you're going to buy a dagger, you might as well get your money's worth. Scabbard: Leather-wrapped wood with steel accents. 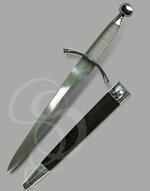 This dagger is shipped with an unsharpened blade, but can be sharpened and holds an excellent edge. 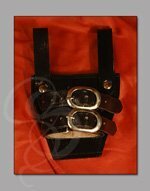 Includes leather scabbard with steel accents. This blade was nicer than I would expect for the price. It's sturdy and well made, though the leather fringes for the grip showed a bit, and the blade sits within the hilt at an angle, but you can only really tell when looking down the blade into the hilt. Sharp, and the engraving looked good, though not deep (wouldn't want to interfere woth the integrity of the blade). It came with oil, cleaning towels and care instructions. We were impressed. Overall, it looks beautiful. My boyfriend loved it for his birthday gift. Beautiful, sharpened, very durable full tang beast of a dagger! For those for whom a dagger is not long enough. 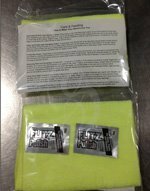 This blade and Dark Recourse are the ideal blades for confined spaces, used together they are a match for any long sword.. This "dagger" is a solid product. It came sharpened and tempered. The designed is based upon daggers in Spain when Swords ownership was limited. The Spaniards did what the Germans did when a similar law was passed - found a way around it. 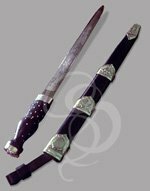 At nearly 18" in length this is longer than the short Greek sword and almost as long as the ancient Roman sword. The handle fits nice. For use in self-defense in an apartment or home and there are no bullets, this does better than swinging a katana or a longsword in a hall way. The only drawback is the scabbard. The dagger fits a bit loose. If that could be fixed it would be a 5 star product. For the money, it is a great investment.